We live at the end of a dead-end road surrounded by forest – an ideal environment for a cat. Dickens was an indoor/outdoor cat, a great hunter who mostly preferred the outdoors. He was particularly prone to upper respiratory infections. Perhaps twice a year he would get what could best be described as a bad cat cold with heavy coughs and sneezes and wheezes. These episodes would come on quickly and the vet could usually mitigate the symptoms with a shot of some kind. The car, or in this case a seriously big and beautiful SUV, was a white-on-white Cadillac Escalade. The pearlescent white exterior and brash 20-inch chrome wheels complimented the white leather interior accented with plenty of elegant wood and chrome. It even had plush white floor mats. The Escalade was my flavor-of-the-week (review car) and I was due to exchange it for the following week’s car on that particular day. They usually swap test cars at my home but I was scheduled to attend a midday short-lead press conference for the Meadow Brook Concours d’Elegance, one of the most prestigious classic and collector car shows in the country. The press event was not far from the fleet management company. So on this rainy Tuesday in late July I would do the swap there. As I prepared to leave for the press event poor Dickens was in the throes of another of his colds. He sat inside our front door wanting to go out while coughing and sneezing and blowing cat snot all over the full-length glass. My wife had to go somewhere that day as well and I had just enough time to take Dickens to the vet for a shot before leaving for the press event. I wrapped him in a large towel and just as we stepped out the door a rainsquall doused us so we were both soggy as we slid into the Escalade. On the way to the vet poor Dickens continued to cough and sneeze, now blowing snot and phlegm all over the Escalade’s dash. Fortunately the vet wasn’t too busy and she got him in right away for his shot. As we left the vet’s office the skies opened again soaking us again. On the way home Dickens began to cry and moan and act like he was in great distress. I was afraid something else was wrong with him. Finally, he slinked down onto the floor and took a big, smelly, wet dump right on the plush white-carpeted mat. As you can see, this day was not starting out well. Dickens seemed better after that and he ran off to hide as soon as we got home. I had just enough time to hose off the floor mat and wipe the dash before heading to the press event in Rochester, a bit more than an hour away. The sky was clearing as I drove eastward across M-59 and Williams Lake Road to what becomes Walton Road taking us into Rochester. Just a few miles east of I-75, in Auburn Hills, Walton Road becomes a broad boulevard with two lanes in each direction and generous turn lanes separated by a beautifully landscaped median. As I crested a low hill I saw a local cop in the median at the bottom with his radar gun pointed right at me. As it turned out, my karma wasn’t too bad after all. 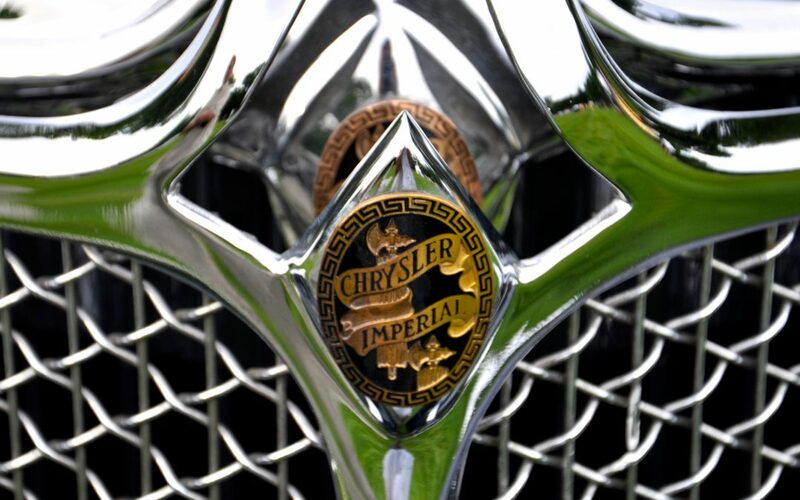 The press event was at an upscale hotel in downtown Rochester where a dozen or more classic and collector cars were strewn around the lush hotel lawn. An outdoor brunch preceded a few short speeches, and when the eating and taking of notes were done I wandered around to admire the eclectic variety of old cars. He was the owner of the car. We climbed up into the big open car with my friend and colleague, Bob Benko, and a couple other people who were hanging around and we took a 5-mile drive around the village of Rochester. What a treat! It drove like a truck, of course, with a huge steering wheel that took great effort to wrestle around a corner. It had a looooong-throw, three-speed floor shifter and with no synchronizers in the transmission I had to use my long-dormant skill of double-clutching. Fortunately, I learned that long ago, so I did not embarrass myself. Around mid-afternoon I left to return the Escalade and pick up my next review car. I got it back right on time and never heard anything more about its condition. I guess I cleaned it up well enough. Now, back to that ticket. About six months earlier the Michigan legislature passed, and the governor signed, Public Act 85, a law that requires municipalities to justify speed limits by conducting a speed study and issuing a speed setting order. The law was aimed at the growing number of local governments who were developing speed traps to enhance revenue. Obviously, the study had either not been done or the results ignored on that section of Walton Road because no traffic engineer with any integrity would post that section of road as low as 35 mph. So, I first pled not guilty to the ticket. Then I waived the preliminary hearing, requested a postponement of the formal hearing when it was scheduled, demanded copies of the speed study and speed setting order (suspecting neither existed), asked for the training records of the ticketing officer to see that he was qualified to operate the radar gun, asked for the calibration records for the radar gun and anything else I could think of. After a second postponement, and having received none of the requested discovery documents I went to the formal hearing loaded for bear. My “Motion to Dismiss” was carefully prepared based on not receiving any of those documents. Mine was the last case called during the morning session that day, so I sat in the waiting area for nearly three hours. Without the usual pretrial conference the prosecutor finally led me into the courtroom where the judge summarily dismissed the case because the cop failed to show. She also editorialized a bit about the problem that no one seemed to understand the requirements of the new speed setting law. I was not sympathetic. That was though, I must admit, the most respectfully I’ve ever been treated in a traffic court where motorists are typically presumed to be miscreants. So, the cat was fine within a day or two, I gave the Escalade a good review and I had my one-and-only experience at the wheel of a massive 1930s luxury car. The annoyance of the ticket lingered for some time but its resolution six months later was at least partially gratifying. That’s just another day in the life of this auto writer.